Hattie B’s takes Nashville’s chicken game and steps it up in a big way. Not a lot of folks will stand in line around the block for some chicken, but it’s the usual at this place. That’s because this isn’t just “some chicken.” It’s Nashville’s famous hot chicken at its finest. Named after the owners’ family matriarch, Hattie B’s offers a non-fussy, fun approach to a high quality product. We took that same approach to tackling every aspect of their brand. 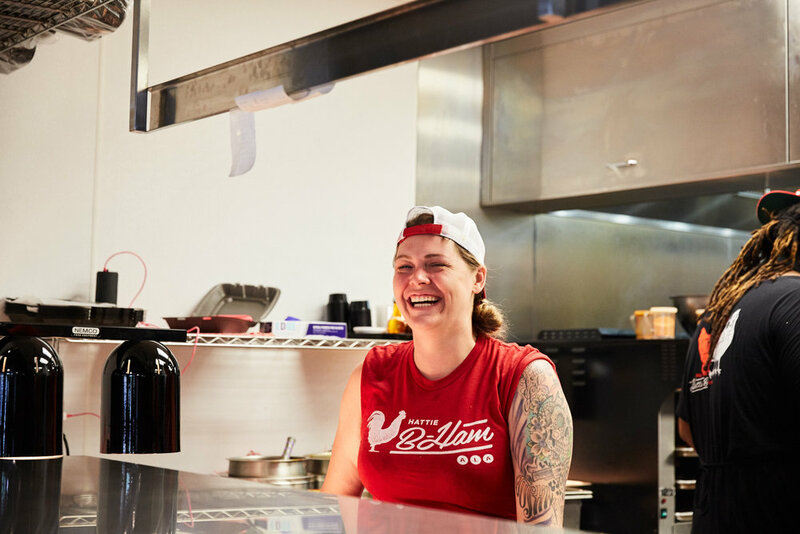 While the look of the brand gives a nod to southern cooking heritage—think hand painted signs on the side of a chicken shack— the environment of each Hattie B’s location is specifically crafted to fit the neighborhood and architecture in which it resides. The website is deceptively simple in design, providing ease of use and mobile responsiveness, while masking the complex systems in place to filter offerings by location and run their robust e-commerce site. As Hattie B’s rapidly expands across the southeast, we dig into every step of building a new location, facilitating fabrication, installation, and permitting, as well as designing all notable architectural components and creating paint schedules. We create location-exclusive signage and apparel that encourages both interaction and local pride, extending the brand’s organic reach by letting the customers do the advertising for us.